Racking Protection - Are Your Shelves Safe? For health and safety managers, no concern is greater than ensuring the utmost has been done to provide a safe working environment. From our years of industry experience, we’ve learned there is nothing more important than employee and people safety. Protecting staff, members of the public and a business’ assets from harm is principal to succeeding in the role. 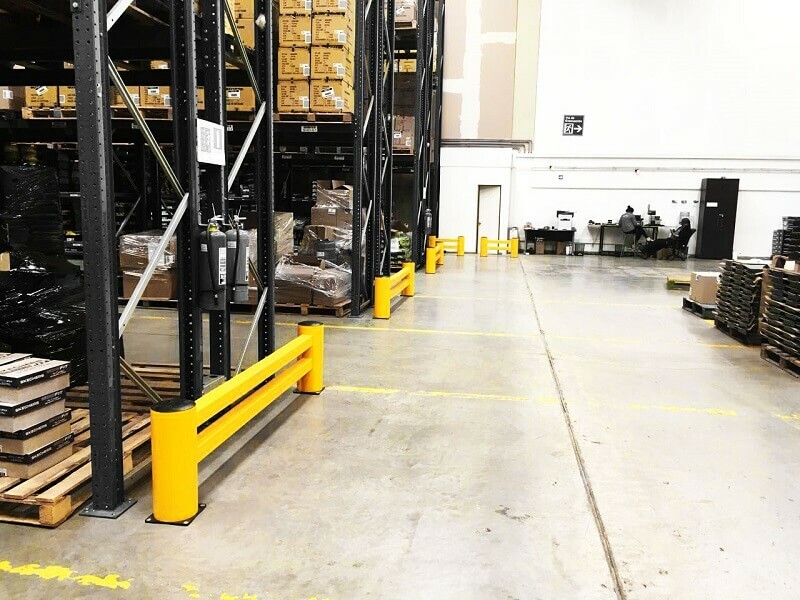 For warehouse safety managers, racking protection is an important consideration due to the potential risk to humans and vehicles that may come to harm in the event of a racking collapse. We recommend undertaking numerous safety measures when installing shelves to the structure of your building for the first time, and equally when repairing existing shelf units. If electrical equipment is in use during installation, it must have an up-to-date portable appliance testing examination. This is usually marked by a sticker, but this is not essential. As a health and safety manager, you should always read in detail any given risk assessments autonomously and with colleagues when required. Repeat when you see fit. Questioning staff on their skill legitimacy, abilities and accreditations is an effective and direct approach to alleviating concerns. You should always make your voice heard to prevent problems. Staff should be regularly quizzed on proper procedures in order to maintain order and high standards. For example, any staff member working in a role which requires interaction with a shelving unit should be able to recite and perform the accepted technique for lifting and moving stock. Now your shelves and racking equipment is installed and securely in place – it’s time to think about how you’re going to keep them protected and safe too. Guardrails and safety barriers are a must for any warehouse, or any other business that holds large amounts of stock. Our very own range of Flex Impact safety barriers are modular in design, so you can mix and match to fit your exact requirements. When involved in an impact, the rubber-like make-up of these barriers absorb all of the pressure, keeping any vehicle drivers and your concrete floor free from harm. In accordance with HSE guidelines any activity involving shelf racking (like inspections, installations, repairs or general work) should only be performed by a SEMA approved racking inspector or worker. You must also check that all vehicles used to move stock onto and from the shelves are in a sufficient working order and solely operated` by staff with the appropriate accreditation, qualifications or licenses. Any third-party contractors working or using your shelving units should also be appropriately informed of your safety procedures. Finally, always ensure the listed appropriate personal protective equipment, outlined in the risk assessment, is worn by anyone working with the shelves. The above covers a small core segment of the health and safety manager role but will hopefully remind you of important industry practices which are sometimes overlooked.